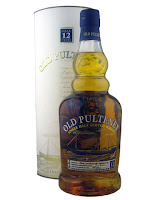 I'd heard a lot of good things about Old Pulteney's standard offering - mainly that it's quite good at its price point. It's also the most northerly distillery "on the Scottish mainland," for whatever that's worth. A few months ago, Binny's had a great big whopping sale, so I picked up a bottle (along with a couple of others), and am presently sharing the first glass with all of you. The color is lovely - just a hint of red in it, showing the influence of the sherry casks some of the whisky is aged in. The first thing I notice on the nose is citrus, opening up into an ethereal, nutty aroma, and finally a little bit of grass. Very nice. It's slightly oily, but quite pleasant. Spreads out nicely on the tongue. It finishes dry, salty-sweet. I can see why so many people like this. Edit: Pear on the nose, too. How did I miss it?